It's been a few years since I was in school, so maybe I'm out of touch with this, but this is how I would try to live plastic-free (mostly) and zero waste at university. I never lived in a dorm, though I did share a small space that didn't have laundry in college, and moved long distance with only a few suitcases. 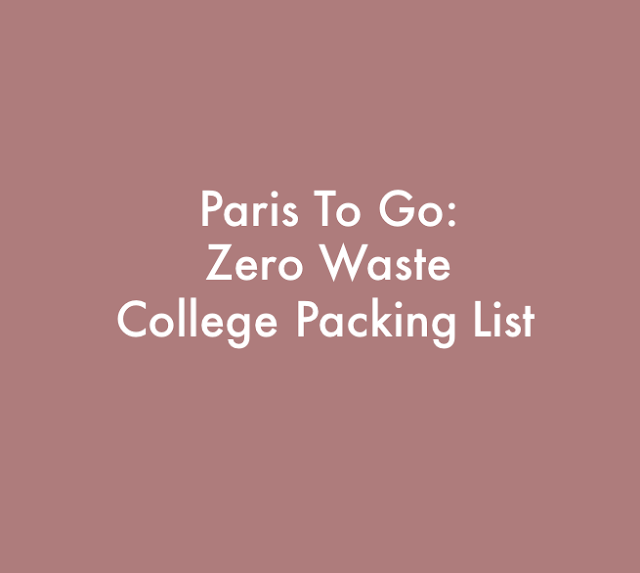 For a downloadable zero waste packing list, click here. Nice pajamas. Pick something you won't feel uncomfortable being seen in, or a robe you can throw on quickly when somebody pulls the fire alarm in the middle of the night. Only Hearts has organic options. Ethical Charentaise slippers are on sale at Zady right now, though I would try to DIY them. A multitasking waterproof jacket. The key is having the most adaptable pieces possible, so they don't take up space in a tiny dorm. It's why I think lined leather boots are better than rain boots. Something nice to wear to interviews, events, and presentations. For general ideas, click here. Sewing kit. Make your own with a zippered pouch, supplies from around the house, and organic cotton thread. As with everything, it's best to use what you already have. Travel steamer. Irons and ironing boards waste valuable space. Lint brush. Click here for recommendations. Hamper or laundry bag. Laundry bag is better for small spaces, plus you can make it yourself. A canvas bag is more durable and less smelly than flimsy nylon. Clothes drying rack or clothesline (if your roommate doesn't mind). These wooden and metal umbrella clothes racks are plastic-free, space-saving, and collapsible. Umbrella. If you don't already have one, and can't thrift one, look into renewable cork or an ethically made option. If I remember correctly, nobody cares what you wear in college. Choose the most comfortable, low maintenance, least smelly fabrics possible- like linen and wool- and pack at least two weeks of clothes, including several go-to outfits for rushed mornings. Eight tops, four bottoms, two coats, four dresses, a jacket, four sets of exercise clothes, three sleepwear sets, two bags, 4-5 pairs of shoes, and however many lingerie sets / socks / accessories / swimsuits you need would easily fit in the tiniest dorm closet, providing plenty of variety year-round. You could even double these numbers, but I recommend taking less and focusing on basics. Your style and body will probably change, so it's better having a blank slate at first. My actual college wardrobe was reviewed here. Most of my professors hated hats, so a scarf or wide headband was helpful on bad hair days, and upcycled ponytail holders to tie hair up for lab. If you get tired of your wardrobe over the course of a semester, host a clothes swap on your floor or with student groups. On an early trip to Paris, a friend introduced me to Tiffany, who started a secondhand shop on her campus and now works at Armani! If you're really motivated, organize a university repair or reuse workshop periodically- for clothes, electronics, whatever- and arrange to collect textiles for recycling from each dorm. Shower caddy: Stainless steel wire baskets, like the kind used in kitchens, are what I would use. Are shower caddies necessary though? Even if you don't do water only, a waxed cotton bag might suffice for most zero waste products, including a bamboo toothbrush, soap, siwak/ waterpik / eco-friendly floss, menstrual cup, safety razor, baking soda, and tumbler for rinsing teeth. Umbra makes a plastic-free bamboo shower caddy, but it's pricey. Natural rubber flip flops for showering, and robe (see above). Washcloths. Base the number on how often you use them to remove makeup, to scrub, etc., and how often you plan on doing laundry. Knitted hemp cloths are antibacterial, can be scrubbed with soap, and hung to dry without smelling bad. Towels. Linen towels are cozy, space-saving, and don't smell when they dry. Soap (or soap nuts). Try to stock up at home, then buy in cloth, cardboard, or paper if you can't find it loose. If there are no all-natural soaps, look for something with as few fragrances and additives as possible. The Environmental Working Group has a great database on the environmental safety and toxicity of common bar soaps. For instance, Basis has minimal impact on the environment. I had a professor let us do soaps in the lab during free periods, which is when I tried my disastrous bacon fat soap- it still haunts me. I was actually no-poo for part of college, before I knew what that was. Otherwise, a shampoo and conditioner bar is practical and long-lasting. Instead of blowdrying, consider air-drying or braids, like the gorgeous Zero Waste Vegan. If you must buy packaged, Elate Cosmetics, Fat and the Moon and Meow Meow Tweet are cute, ethical, and responsibly packaged in reusable glass, aluminum, etc. Le Labo, Kjaer Weis, and Ellis Faas are refillable, but pricey for college students. For more affordable perfume, try refillable glass bottles from Call of the Vialed. Decor. Think reusable, and try to use what you already have- plants, fabric wall hangings, weavings, crocheted blankets, pillows, floor pillows for friends to sit on, upcycled mats, rugs, books, and handmade ceramics (DIY ideas for these items in the Zero Waste Master List). Display photos in frames, or use cork and reusable push pins. Try a sisal or jute doormat to wipe shoes on slushy days. Power strip, to switch off at night. You may also wish to look into wooden, steel, or bamboo flash drives, if you don't already have one. Don't forget rechargeable batteries in addition to your laptop, case, devices, cables, etc. When I went to college, streaming and computers made TV-and-DVD-less dorm rooms possible. I always printed on university printers instead of buying one of my own. Solar flashlight. Or try plastic free beechwood. Bedding. A wool mattress pad is your best bet. There are organic hemp, cotton, and bamboo mattress protectors in longer lengths packaged in hemp and corn, but backed with polyurethane. For sheets, make your own, use what you have, or ask for 39x80 linen sheets from Etsy and XL Twin organic hemp sheets from Rawganique for graduation :) I would just bring my own comforters and blankets (if you're crafty, knit a cute chunky one). Ditto for my own pillow, although a bamboo, wool, or natural fill pillow would be fine. Two linen sets seem like enough to me. Note: If bed bugs are a problem at your school, plastic is useful. Buy a special spray, pillow protector, and waterproof zippered mattress cover. Bed risers. If necessary, upcycle plastic-free lifts from scrap materials or use steel / wooden ones. A lofted bed is dangerous if not done correctly though. Sleeping bag. I don't know that it's needed, but it shows up on a lot of college packing lists. Here are recycled and tencel options. Hangers, mirror, wicker basket (or several) for laundry / storage. Fancy organizers are probably unnecessary, but a door mirror, baskets, wooden hangers, and a box for lingerie / socks or DIY jewelry holder are good ideas. I don't see why a college student would have so many shoes to necessitate a shoe rack. Instead of using space bags, put out-of-season clothes in a basket on the floor or in the closet. The dorms at my school had nightstands, desks, and chairs. Otherwise, I'd bring something from home or source furniture secondhand. To organize my room, I'd keep textbooks and papers at my desk and recreational reading in the nightstand. I'd hang coats, jackets, crisp button-downs, and dresses, fold everything else flat, storing bras, undies, and socks in a box, with leggings and tights rolled like tiny Cinnabons. The steamer would go in my closet with the clothes rack and lint brush. Luggage would go under the bed, shoes and laundry bag by the door so they were readily accessible, and toiletries too, if space permitted. Soap. Soap flakes, or soap dissolved in hot water, seems to work fine in most shared laundry machines. Otherwise, use baking soda and washing soda, or stock up on an eco-friendly brand. Vinegar. If you must buy it in plastic, I would buy big plastic jugs (1 and 2 plastics are most commonly recycled) to pour into a glass spray bottle. I don't know that expensive glass Heinz bottles are really better in terms of emissions. Cloth rags. Old t-shirts will do. Homemade scrubbies. Better than natural sponges / brushes if you don't have composting facilities on campus. Baking soda. In a box or paper bag if you can't find it loose. Vodka. In a spray bottle, instead of Febreze! Bring a broom or hand vacuum, and open windows or keep plants to freshen the air, instead of room fragrance. Most college students probably still need a wastebasket, if only for recycling. Reusable shopping bags and containers. A cart can be helpful, providing storage when not in use. If you're in an area where bulk liquids are available, pack a few glass bottles with your sheets. No bulk options? Don't stress. I grew up in a rural area and still don't shop at bulk bins (I prefer putting sauces on lentils, cauliflower, and spiralized veggies instead of dry pastas anyway). Stick to loose or semi-loose fruits and vegetables. Ask the deli counter to put meat and cheese in your jar, tiffin, or reused Tupperware. Buy juice and milk in returnable or glass bottles if available, and items in cardboard, cloth, or paper instead of plastic to the extent possible. The important thing is to stay healthy and maintain a balanced diet, so if buying packaged foods is your only option, do it. If you have time, write the manager about your zero waste choice. You could ask professors to help you reach out to local farmers in the area. Jar, canteen, or mug (or any combination of these). The jar can pull double duty for coffee and drinks, with a cozy to prevent breakage or insulate liquids. Reusable utensils and cloth napkins. You can't always avoid packaging when restricted to cafeteria food, but bringing portable reusables will reduce disposable waste (even if you live in a drought state, reusables are better). Ask the cafeteria if you can bring your own containers for meals. They may be happy to oblige. If your school doesn't have a composting program, start one! Should the university say no, try to limit food scraps, using every part you possibly can. Arrange a campus cleanup, or volunteer at a local garden. Bike and walk around campus; carpool or use public transportation (if available) when traveling further. There are plenty of ways to make a positive impact on the environment, even if you can't live perfectly zero waste. For school supplies, I didn't use much besides a laptop. Some countries have burgeoning secondhand and vintage markets along with old mainstays Freecycle and Craigslist. Apart from FSC-certified printer paper and the occasional ream of hemp paper, my assignments were primarily digital. All my textbooks were digital or used, and I typically sold them after. Now for the zero-waste move. If your family has big reusable plastic storage bins or trunks, try and fit as much as you can in those, or use boxes around the house, look for moving boxes on Freecycle and Craigslist, and reuse / relist them afterward. My friends recommend liquor store boxes for moving. Some countries have programs to rent eco-friendly moving supplies; Carton Plein is one in Paris. I fold boxes shut by the flaps, but you can use paper tape, twine, or rope to secure them. I took glass bottles, plates, and even beer overseas with no breakage by wrapping them in clothes, towels, socks, and sheets. My last advice for living zero waste at university is say no to free shirts, fliers, notebooks, pencils, keychains, magnets, etc. For a downloadable version of this post, click here. P.S. This is not meant to be an endorsement of college. Actually, if I were to do it all over again, I wouldn't go. I'm grateful for the privilege I had to graduate and don't wish to diminish the hard work of those in the university system, or judge the decisions of others. I just don't want this post to imply that university credentials are necessary to be educated and successful- I don't think they are. I have to say I was so poor when I went through university that I was almost zero waste without even thinking about it! But some great ideas here for those who are not in such dire straits. Re the organic hemp sheets - the owner of a men's clothing store recently told me that hemp is not really a green product as we've been led to believe. The reason being that although it may be organically grown, a truck load of chemicals are used to extract the hemp fibres for fabric. I haven't researched this enough to know if there really is an organic way to extract the fibres, but an initial web search brought me a video where I saw 5 or 6 chemicals being added in the first 90 seconds! I think we have to be very astute when purchasing because green is 'in' at the moment and lots of less than ethical companies are jumping on the band wagon. You can, for example, find organic cotton clothing dyed with toxic dyes, or bamboo clothing that has also had lots of chemicals used in the extraction process. This is disappointing to say the least because finding ethical food and clothing almost becomes a full time job! For myself, I'm trying to stick with traditional fibres naturally processed where possible, and moving more towards making my own. You're right, this is a very important point Madeleine! It's so cool that you're making your own, please tell me more when you start doing that. I'm interested in spinning and processing wool at the moment but... I find it's not fun. Anyway, hemp is a huge subject of greenwashing, which is part of the reason the Hemp Industries Association was formed. Did the video show that hemp fabrics can have formaldehyde, bisphenol A, and heavy metals in them? Plus I read it's a common misconception that hemp aerates the soil, it secures topsoil, but it prefers to grow in aerated soil. I just hope that students will use what they have first and buy 'green' as a last resort and will keep in mind my greenwashing and natural fabric posts. GOTS-certified hemp is still, from what I can find, safely extracted (or at least no pollutants end up in water or the finished product). Hungarian and Romanian hemp was generally recommended to me because they truly use organic processes and growing methods. The chemical laden ones are actually an inferior product, because chemicals degrade the quality of the end fabric. I like Rawganique because from everything I've read they are family run, offgrid, use GOTS-certified textiles, and source their hemp from -I BELIEVE- fair trade producers in Romania... I hope it's all true! Please tell me what else you find! In my natural fabrics post and greenwashing posts I mentioned bamboo being chemical intensive and cotton being pesticide laden, I hope that people will research their suppliers. I recently ordered some organic cotton espadrilles and asked a bunch of questions first. I guess most fabrics have some downside to them if scrutinized enough. Check out Maca. They make gorgeous hemp rucksacks dyed entirely chemical free with turmeric. If I were going back to school today, I would love one. That is gorgeous! Love the idea to dye with turmeric. Thank you for sharing. I think they are in the book Fashion and Sustainability: Design for Change? You reminded me, the book touches on the greenwashing problems with bamboo, but also talks about the responsible, small scale growers and hemp textiles in England (another good source for the fabric). They include a map showing what fibers a sustainable world would use and discuss how Northern Europe, for instance, would rely primarily on bast fibers based on local materials. Interesting read! Thank you for this comprehensive list! My daughter is starting college in the fall so you've given me so many great ideas! I agree with you on not going to college. I teach at university and am getting a Phd next month. And I think you dont need to go to college to learn what I have learnt. Its nice to be tucked in a research lab that funds your projects but the startups have figured out a way to do the same if you want ownership of your work. And most folks are happy to work in a corporate setting. There is no need for formal education anymore. I am happy that the world is moving in this direction. I live in two places. Half of the month in Arizona for my teaching duties and the rest in california with my husband. Its shocking as to how little i can get by living in university town. And I am zero waste. I own a 18 piece wardrobe and two pots (pressure cooker and a iron wok) and a bike. And sleep on the floor. And live a perfectly happy life. Its back at home where the entertaining gets out of hand and we are sucked into the lifestyle with lots of temptation to keep up with the Joneses and lifestyle bloggers. The contrast couldn't be more stark which worries me about myself. "Decor. Even though my apartment is minimal, I have a nice view, pastel furniture, cute cats, and plenty of natural light. " love this quote. Wonderful post. Thank you ! Fashion Revolution Day is coming. I hope you make an educational post. I wanted to, but I don't think I am there yet to be preachy. I have so many bad habits. But you can ! Archana, this is so interesting to hear from an academic perspective. And congratulations on your Phd!!! That is wonderful. I am so happy that you are zero waste at university. That is a huge victory! I was thinking about what I can post for fashion revolution day but I don't know! You are in a great position to write a post I think. You are selective, thoughtful, and buy well-crafted things you won't need to replace often. H&M has its PR campaign called recycle week during the same week. And they are hijacking the revolution day. They want you to bring in some old clothing for 30% discount in store. Nobody should be shopping there if they care about the environment. Its awful. I only want to write something to make some noise. I dont want them to win. p.s: I read about a river in India. You could apparently figure out color of the season by going there. They dump all the waste in the water. It was purple for a year, then blue-green and now just dirty and dead. For the first time, the tiger populations are on the rise according to NatGeo. Gives me hope that we can clean up our mess. http://ecocult.com/2016/i-talked-to-hms-head-of-sustainability-heres-what-he-said/ Did you read this? They didn't even know it was Fashion Revolution week at the same time. Fashion Revolution Week had to contact them first. That is terrible about the river. There are similar ones in China. In Korea they have one or two weeks a year when wind carries pollution from China and people have to stay indoors because if they go outside they'll be sick. Fantastic article. Happy to see the wheel turning. I think this is all very solid advice! I wish I had been more conscious of these issues when I was in college, it would have saved me moving a lot of junk back and forth, and made the tiny dorm I was living in much more spacious. For those students who have a kitchenette, I would suggest a cast iron skillet, as they are very versatile and last forever. My set of non-stick pots and pans from college are long since gone. That is a great suggestion Elizabeth! My sister and her husband registered for a cast iron skillet for their wedding and received several, which is great because my sister can't eat gluten and my brother in law can. They are a wonderful investment and between that and a kettle can really take care of almost all a student's cooking needs.